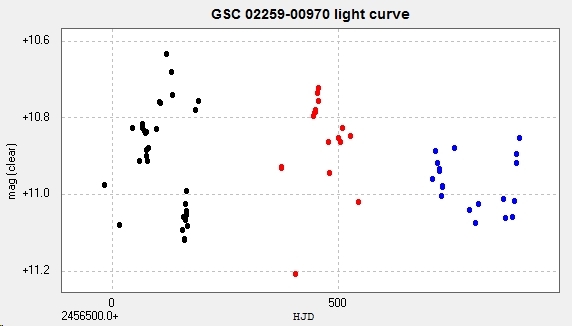 ​Light curve and phase diagram of GSC 02259-00970. This was my 20th variable star discovery, confirmed on 29 March 2016. This is a semi-regular variable in Andromeda with a period of 79 days. It was discovered using Muniwin on 71 unfiltered images taken with the Cluster Camera of the Bradford Robotic Telescope between 2013 July 8 and 2016 January 11. 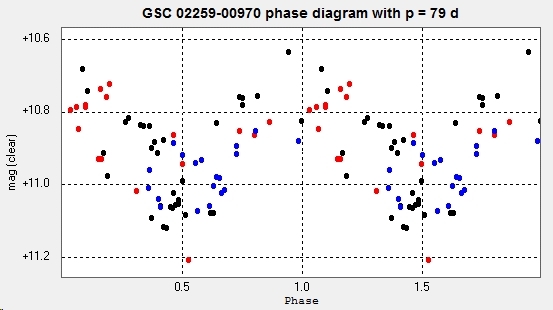 The light curve and phase diagram were constructed using AIP4WIN photometry. For more information see the AAVSO VSX.